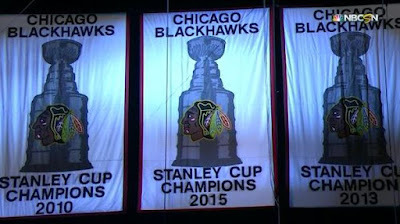 The Chicago Blackhawks won the Stanley Cup in 2010, 2013 and 2015. They are considered a modern day dynasty. This will look at all 3 teams and compare them statistically. Each team is compared through the regular season & playoffs with various of sub-categories. First off this is the lineup used in the last game for all 3 teams. In 2013 & 2015 the Hawks only had Toews, Kane, Sharp, Hossa, Keith, Seabrook & Hjalmarsson left from the 2010 cup. This is the "core" of the Blackhawks. *Below I list numbers out of 30. That is where the Blackhawks ranked that season out of the 30 other NHL teams. 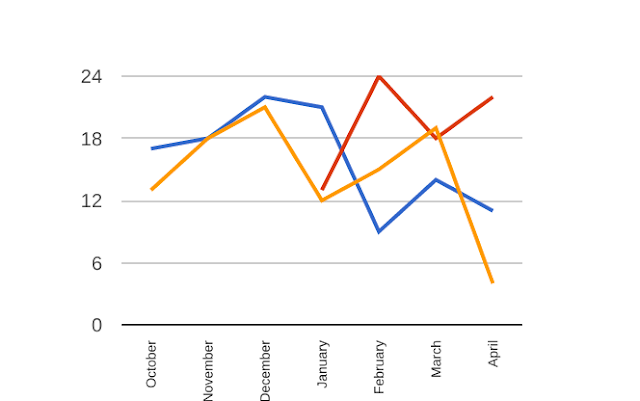 The Blackhawks regular season peaks during December in both 2010 & 2015. 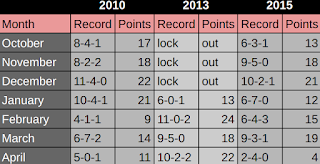 Since the lockout in 2013 it is hard to judge how a full season would've played out. Also interesting enough the Hawks tend to take it easy after January. Both in 2010 & 2015 they have 1 month in each with 7 loses. Both after January. Here is one more graph showing this data (Blue is 2010. Red is 2013. Orange is 2015). Line depth is something the Blackhawks relied on for all 3 cups. Just for ease I used all the lines listed above numbered as 1-4 which were the last used playoff lines. I know this might not tell the true story of the regular season but just simplifies things. In 2010 one could argue the Hawks truly had two first lines in terms of production. Also worth noting that 2015 had a better fourth line then 2013 however the opposite is true for the third line. 2010 overall had the most depth. I included Corsi (Shots + shots attempts that missed the net + shot attempts that were blocked) for puck possession numbers. It is strange that despite the amazing 2013 regular season the Blackhawks didn't finish with the highest Corsi like the other two years. *Below I list numbers out of 16. That is where the Blackhawks ranked that season out of the 30 other NHL teams. I looked at line depth for the regular season. I figured with the trades at the deadline not being able to have a big enough impact on the numbers it was best to look at the playoff numbers separate. The regular season two first lines in 2010 turned into a first line, with the second and third with pretty even production. However in 2013 playoffs the Blackhawks had two lines producing like a first line with the third and fourth lines even. The most unquie of the three is in 2015. The first line was clear cut the most effective. I had to include this section based on how large of a factor the media played this up during the 2015 cup run. The number with the blue background is average time on ice. 10: Noted that Byfuglien moved to forward for periods of the playoffs. 15: I decided to include all 9 players and show the games played just to give an idea of how much the top 4 were actually used. The only goalies to get a start through the 3 runs were Niemi, Crawford & Darling. I didn't include Darling as he did not play the majority of games (he played 3). Although all 3 teams were great and the core of the Blackhawks was good enough to win 3 cups in 6 years, the team progressively got worse. It makes sense in a salary cap era. If you agree or disagree let me know in the comments. Either way I am happy to have seen 3 cups for my favorite team.